A group of cows go into a room with an elephant. No, this isn’t a joke. On a chilly Sunday morning in December of 2012, the returning veterans of Madcow gathered in the living room of Nate Botti’s Columbus home, with one elephant in the room: “What are we going to do to make this season productive?” as captain Phil Cherosky put it. The team was staring down a rebuilding year. A number of long term players were departing from or had already left the team, including names synonymous with Madcow, like Timmy and Jeff Meyers, Kevin Reichert, Jeff Kula, and Michael “Biggs” Groeber. The team’s Indianapolis contingent was also choosing to separate. Some of those players had heavily influenced the personality and direction of the team. Even the team’s player/coach, Rodger Oakes, was dropping the coaching role. Their problem was’t a lack of change — the team had that in spades — but rather what to change. With the process accelerated by the possibility of the Nexgen League, new leadership was installed. Cherosky, Nexgen player Mitch Cihon, and Joe Taris were selected as the triumvirate to shepherd the herd in the right direction. The new captains set about redesigning Madcow. Paul Greff, an experienced Columbus coach and player, was brought in to help the team design their systems. With no more out of state presence, Cow rebranded themselves as an All-Ohio team, with a new logo and jersey design to emphasize their new identity. They began recruiting harder around the state, paying off in tryouts from Dayton, Toledo, Cincinnati, and sometimes-rival Cleveland. “I guess my expectations for Madcow starting the year were ‘Let’s start building a program’, but during the tryout process, we realized we have some young talent that’s really impressive. Guys that could come in and make an immediate impact for us,” said Botti. The team took on a class of 12 rookies. As usual, they tapped the local talent from Ohio State Leadbelly, like Hamza Dodo, Justin Bauman, and David “Temp” Bentrovato. Ohio University added Logan Kruger, Matt Olson, and Mark Hritz. Brandon “BT” Thomas and Josh Swanson came in from Cleveland and Mark Federenko from Dayton. They invaded the Columbus Mixed scene to get Eliot Alexander and Nick Hamilton. “With so many young guys, we didn’t have the same skillsets we used to. We wanted to be gritty and work it under,” explained Cherosky. Thus, the team put the focus on the fundamentals Madcow’s reputation belied. The “huck it hard, play D harder” philosophy that typified Madcow’s recent iterations was transformed into a hard grinding team that was willing to work for every yard on both sides of the disc. 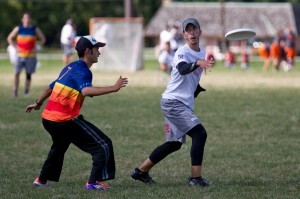 The team ran exclusively vertical stack for their first four tournaments (including unsanctioned tryout tournaments), a decidedly new approach. Where in the preseason was a void left by missing parts of old Cow, there now was a blank slate. Empty space became opportunity. The team’s youth and inexperience wasn’t a hindrance, but rather their fresh outlook and hunger was the team’s strength. After opening the season officially at Motown Throwdown, where they lost to new rival High Five 11-10 in the final, the team traveled for their two most competitive outings. They began August traveling to Colorado and would later head to Maryland. Colorado Cup was rough, a 3-4 outing highlighted by a 13-8 win over Condors, but lowlighted by losses to Cash Crop and Madison Club. Chesapeake Invite was even worse, a win-less weekend where almost every loss by three points or less. The mistakes were those of a young team finding its way. Cherosky and former cutter Jordan Rhyne were integrating two rookies into their offensive handler group. The team was operating in a new offensive system. On top of that, injuries were taking a toll. Cihon returned from the Nexgen Tour – he also had yet to build team chemistry – too injured to really play. 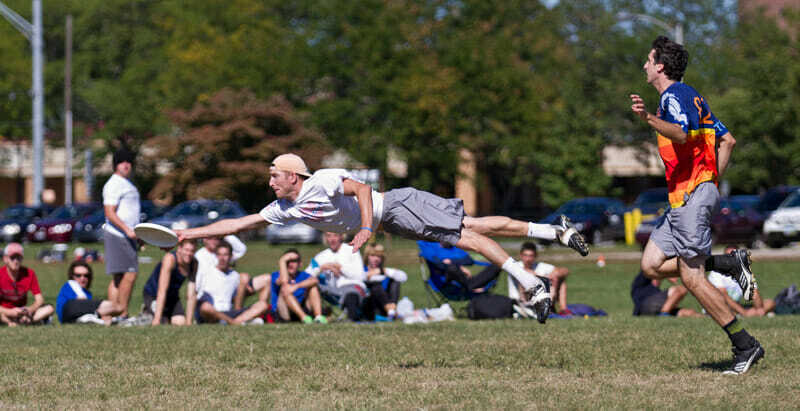 Kevin “Willis” Ryan, another one of the offense’s most potent weapons, struggled with his own ailments. Federenko, by many accounts the team’s top recruit, and at least four other returners were also below 100%. On top of his injuries, Cihon seemed to distance himself emotionally from this new group of players. Between his time away for the Nexgen Tour and inability to help the team on the field, it seemed like he checked out in the early portions of the season. While the captains battled their own doubts, the team on the whole saw signs that inspired confidence. Despite the team’s many reasons to implode, they felt positive about where they were. All the tight results told the Madcow players, young and old, that they were just a few steps away. Considering they had lost on double game point in the game to go two years in a row, those last few steps could be terrifying. Instead, when the results were taken in context, there was an air of hope seasoned with an unsatisfied yearning to close that gap between what is and what could be. “We never once at Chesapeake Invite felt like we were outmatched,” said Cherosky. The most important element of change for this new iteration of Madcow was how they responded to their series of losses. Their newfound optimism was possible because the team remained loose. In the past, practices were high intensity affairs, and it wasn’t uncommon for yelling matches to break out during a scrimmage. A lot of the negativity that had crept in from past years came from the ego that had grown around the team. 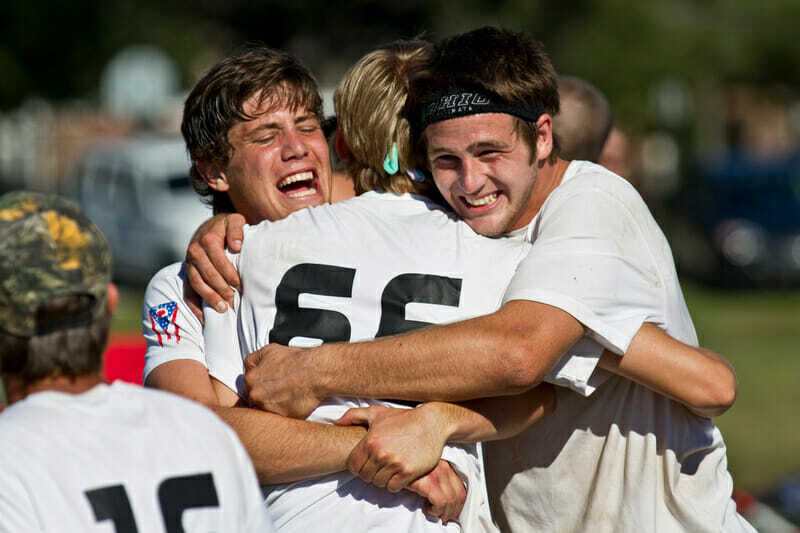 After qualifying for the Club Championships in 2009 and 2010, Madcow as a whole started viewing themselves as a team deserving of their spot each year. Struggles were met with a “we’ll be fine at Regionals” nonchalance and even high caliber opponents were trash talked. Entitlement and cockiness intertwined, mixing into a deadly cocktail that didn’t serve to help the team recover when the chips were down. “Our attitude is a little more scrappy. Our attitude is a lot less entitled. Our attitude encourages guys,” Botti said of this year. 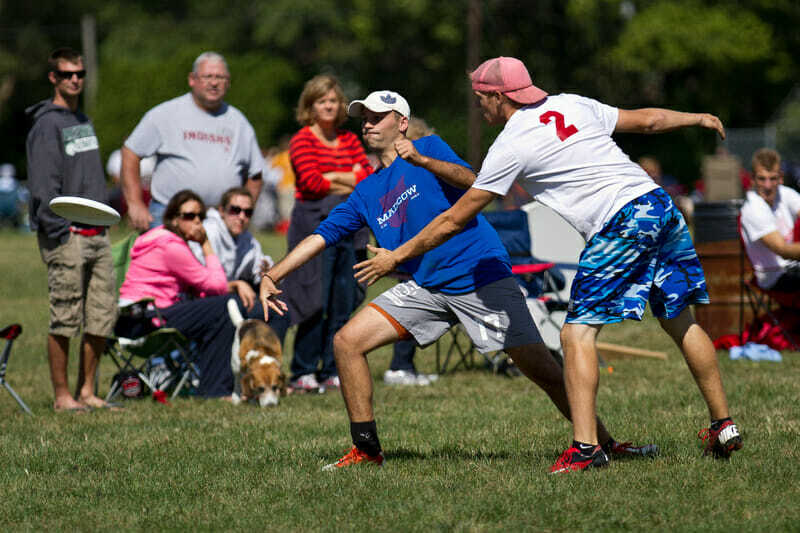 It was a change for Botti personally, whose competitive Ultimate career began with Madcow, and who had grown up as a player drinking his own kool-aid. Whenever the team was in danger of “taking themselves too seriously”, as Botti put it, they’d find ways to loosen up. Shedding their sense of entitlement allowed Madcow to become the underdog and find a way to grind harder at practices and continue their growth. The eight veterans who had been to nationals with Madcow previously built on the kindling and the small sparks that ensued, aiming to pitch on the pieces to light the team ablaze. With two bids up for grabs at Great Lakes Regionals, it looked entirely likely Madcow would end the same way they had the past two Regionals and felt they had this season: so close. Chicago Machine was a lock to win the region and Michigan High Five was 2-0 against Madcow on the year. It would be High Five standing between Madcow and a return to the Club Championships. Feeling they had the advantage in the deep game, the Cow captains approached Botti and Ryan before the game, explaining they wanted to run the disc through them, with the goal being to generate great downfield shots for them to take. The strategy paid off, with Madcow rolling through the second half to win 15-10. Serendipitously, it was Botti who would find Ryan for the game winning score. As the four seed in Pool B, it will be an uphill climb. Very few are predicting much success for the Ohioans. Their results back up that skepticism. However, a healthier Madcow is traveling to Frisco with intentions of defying expectations and riding their fresh perspective to success. There are weapons that could spark an upset. Botti and Ryan are both dangerous under cutters with big throws, and Ryan in particularly is a cutting option the team can rely on. Cherosky called Cihon “the biggest playmaker on our team” when the former Ohio stud is healthy. Hardworking and diminutive handler defender Michael “Tang” Meilstrup is the “heart and soul” of the D-line, per Cherosky, pestering even elite handlers into mistakes, while Justin “Juice” Bauman has been a force in the deep lanes after a turn. Madcow has some real talent. They have unity, fire, and probably most importantly, belief. That may trump being the youngest team in the Men’s field. Whatever Madcow’s results in Frisco will be, it can be expected they’ll have fun and push whatever seven opponents take the line against them each point. It’ll be a new version of Madcow, finding its own way through the trials and tribulations that the Championships present. They’ll navigate those waters together, battling against predictions for their failure, low expectations, and difficult circumstances. There will be those who say Madcow doesn’t deserve it. Comments on "Younger, Fresher Madcow Comfortable With No Expectations"